Showing results for tags 'black wheels'. I am new to the forum and after some pretty extensive searches here and google, I can't find the setup I'm considering. 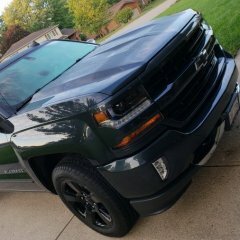 I have a 2017 Silverado Z71 LT in Graphite Metallic. I love the color! I have the 20" polished aluminum wheels, and I'm considering swapping them out for the 20" black versions found on some of the WT models. Has anyone seen this combo and/or can post some pics or commentary? Since there is so much variation in the Graphite Metallic color, I'd be curious what black wheels look like. Thanks for your help!